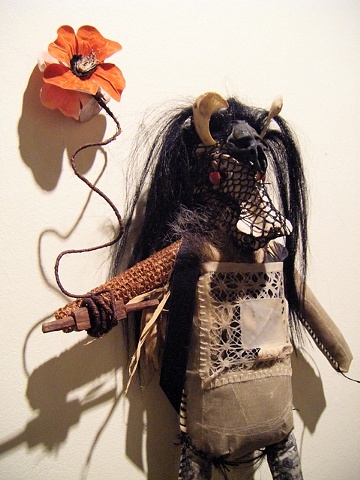 Human hair, bone, fabric, funerary flowers, buttons, corn cob, found doily, grosgrain ribbon, waxed linen, feathers, squirrel tail tip, beeswax. Jack-a-Lent is as close to a traditional scarecrow as I get. 'Jack-a-Lent', in Shakespearian times, meant a poor, sheepish fellow. His little plastic red heart button eyes are full of love for you, but also a little like something creepy in the dark. His head is a created skull, fashioned from a bird's spine and an upside down raccoon skull netted together with waxed linen, and topped with a muskrat skull dyed black with Easter egg dyes. His 'do is real human hair and one arm is a dried corn cob. Faded flowers from a Remembrance Day wreath are suspended above him like a kite. Jack-a-Lent is fronted with a waxed vintage doily pocket that holds the end of a squirrel's tail and some other little shamanistic treasures. His skinny legs are cuffed with strips of reclaimed rabbit fur. His body is waxed fabric, stuffed with wool and human hair.